Athletes appreciate the unique design, variety of terrain and challenges found in our trail system. From the outset, our trail system and facilities were designed to standards capable of hosting provincial and national ski competitions. 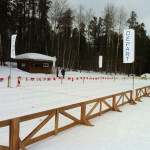 Significant race events have been held at Temiskaming Nordic in past years starting with the 1995 Ontario Championships. 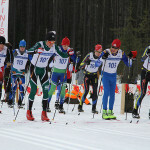 The largest race event held was the 2000 Ontario Championships and Canadian Masters when over 320 skiers from across Canada took part. In 2014 and again in 2015, Temiskaming Nordic proudly hosted the Ontario Midget Championships. The design incorporated the essential key technical elements including a stadium area and a natural amphitheater near the chalet. This provides great views for parents, coaches and spectators as the trail network leads the athletes to pass within view from the stadium/amphitheatre area several times throughout their race. Temiskaming Nordic’s wide range of terrain (from gentle to extreme) and technically-challenging trails attracts skiers and teams who are looking for variety. Offering spectacular views, the Red Trail is not for the faint of heart. Both physically and technically challenging, the trail repeatedly takes skiers up and down glacial moraine hills, offering exciting downhill challenges cornering through runs such as the Bobsled and the 180-degree banked turn known as the Carousel. There is 44 metres difference in elevation from the chalet to the highest point of the Red Trail. With 3 ‘A-climbs* — a total of 188 metres of climbs — and all downhills with technical and fun features, we believe the Red Trail to be the most physically and technically challenging 5 km trail in Ontario. The rolling terrain of the 8km Blue Trail includes moderately technical hills as many end with banked corners leading into the next uphill. Skiers enjoy the flowing trail with few straight sections and undulating terrain. The optional 1.2km Special Blue (intermediate) and 2km Super Blue (advanced) loops at the far end of the trail provide an increasing challenge for more experienced skiers. The Super Blue has three major downhill runs, each with unique technical and ‘fun’ features. The Green Trail winds through a jack pine seed orchard and then offers the options of the east and/or the west loops before looping back. 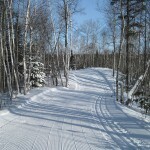 The different routes provide from 2km to 6km of gentle grade trails ideal for those skiers wishing to improve their classical or skate technique. 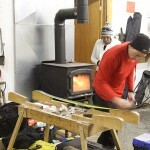 Temiskaming Nordic is an attractive site for early season training for skiers from across northeastern Ontario because of its smooth, sandy, and well-drained trails. When other clubs are just beginning to build a base of snow on their trails, skiers at Temiskaming Nordic are already enjoying early season skiing. 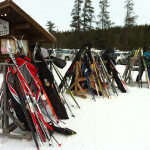 With only a few centimetres of snow on the trails, skiing conditions are often acceptable or good at Temiskaming Nordic. As a race and training host, Temiskaming Nordic is known for pulling out all stops to give racers a first class experience, including top notch grooming, excellent prizes and enthusiastic volunteers.